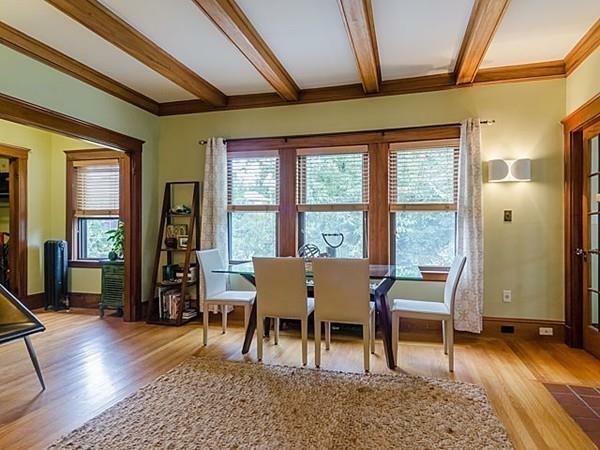 Renovated Craftsman-Style apartment with 7 rooms and 3+ bedrooms on the top 2 floors of a classic 1918ca two-family. Located 2 blocks from Cushing Square, this unit features modern amenities and old-world charm. New modern kitchen with high-end European stainless steel appliances, quartz countertops, oversized windows and a French Balcony for lovely afternoon sunsets. Open & airy throughout with period architectural details including beamed-ceilings, wood burning fireplace, French Doors, hardwood floors and gumwood. Renovated bathroom with classic subway tile, deep soaking tub and German fittings. Large yard, private southwest facing deck, new full-size Electrolux washer and dryer, 2-car parking, modern gas heating with efficient zone valves, ample storage and tons of light throughout. Pet friendly. Disclosures Please Note: Google Photos Show Front Of House Prior To Complete Re-Shingling in 2017.